Use curly endive, radicchio and other salad leaves that have a bit of bite. Put salad leaves into a wide, shallow bowl or on a platter. Sauté bacon gently in a heavy-based frying pan until it starts to render some fat. Cook until crisp, then break into pieces and add to salad. Halve any larger mushrooms. 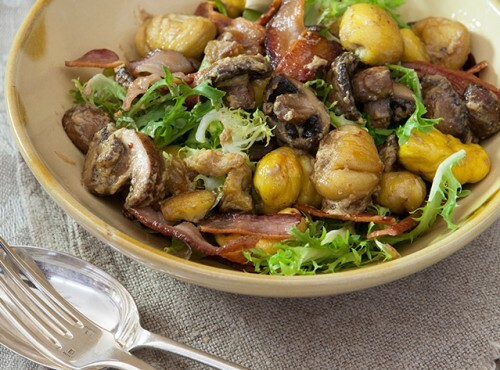 Toss mushrooms and chestnuts in hot bacon fat for 2–3 minutes, then remove and add to salad. Add mustard to pan with oil. Stir to mix, then add vinegar. Pour hot dressing over salad immediately and toss to mix. Season with black pepper. Serve at once.